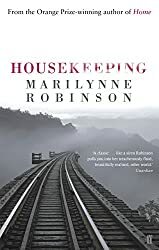 This week’s book is Housekeeping by Marilynne Robinson. My name is Ruth. I grew up with my younger sister, Lucille, under the care of my grandmother, Mrs Sylvia Foster, and then when she died, of her sisters-in-law, Misses Lily and Nona Foster, and when they fled of her daughter, Mrs Sylvia Fisher. A sad opening, I thought. Two young children passed from pillar to post. See my previous post for the synopsis. Love how the tracks on the cover seem to go on forever. Oh, this does sound like a sad beginning, Margaret. At the same time, it sounds interesting. I’ll be keen to know what you think of it when you’ve read it. It’s a sad book, Margot. I have finished reading it now – and thinking what to write about it. I’m wondering is Sylvia’s staying is a good or a bad thing. Ah, Laura, that is indeed the question! It’s a sad book, although there is some improvement by the end. Doesn’t sound like my genre but I’d be interested in knowing how the girls fared. My 56 book is Fire Touched by Patricia Briggs. Happy reading! I;ve finished the book now and will write about it in the next few days. I do like the sound of this one and I feel so sorry for the girls at the beginning. Being shuffled around like that can’t be easy. It is good in a melancholy sort of way and I too felt so sorry for the girls. Sounds like the poor girl got moved around a lot. Sounds like the makings of an epic story though! Happy weekend!! This sounds good. I read Lila by the same author last year. Happy weekend. Here’s my Friday Book. I did enjoy it Bev – if enjoy is the right word. I haven’t read Lila – did you like it? A modern classic! What a wonderful book. Thanks for playing along on BBOF, even though I didn’t have a Mr. Linky this week! Thanks for hosting , Gilion – much appreciated. Lauren, that’s good to know and I’ll pop over to look at your post. It really does seem sad. But what a lovely cover. Hope you enjoy it! As I’ve already comment, Mareli, it is a sad story, but one worth reading I think. I’ll be writing about it in the next few days!